Adam Powell spent three seasons in a Chiefs uniform beginning in 2001. In his third and final season he was team captain and scored 54 goals. In part one we’ll talk to Adam about his days in a Chiefs uniform. Part two will follow next week and will key in on what he’s been up to since graduating from the Chiefs program. JB: Take us back to 2001 and tell us how you ended up in a Chiefs uniform. AP: I got extremely lucky, that’s how I ended up in a Chiefs uniform. I had attended Global Sports Showcase in Langley for the two years leading up to the Chiefs main camp at Twin Rinks in Sardis. Roy Henderson must of really put in a good word to Chiefs General Manager and Head Coach Harvey Smyl and Assistant Coach Dean Kletzel because I felt WAY out of place at camp. This team was stacked with great players, and great people. Guys I looked up to and still do, Jeff Barlow, Bobby Henderson, Gabe Gauthier, Jeff Tambellini, and many more cruising around making the game look easy. I just got lucky, showed some toughness, fought Dan Mahe (TOUGH SOB) and made the roster. I will never forget how great Mahe was in teaching me how to fight and protect myself Chilliwack is and always will be the most influential time in my life. The love that city has for its hometown hockey team made me a hockey fan for life. Harvey and Dean and all the players along the way, I will NEVER forget Chilliwack. JB: That team was one of if not the best team the Chiefs have had. At what point did you realize it was a team that had a real shot at winning a championship? AP: Honestly not to sound cliche, but pretty much right away. We had SUCH a tight knit group. Everybody did everything together, and we scared the crap out of other teams. I recall this team never being out of a game. If we had a lousy start, or a bad first half of a game, we would scare the other team and use our skill to come back and win. That first line was deadly (Jeff Tambellini, Gabe Gauthier, David Van Der Gulik), and if the other team had a shut down line for them, Micah Sanford and Kaleb Betts would do the rest. It was scary how good that team was, and we played in front of the best fans in the world, in the best barn in the world. We knew how to win at home, and we knew how to win on the road. Not to mention the great leadership we had. Jeff Barlow was a world class leader, and really groomed Bobby (Captain), and myself (captain) on how to lead the right way. Chilliwack had such a great culture that was instilled into all of us. I coach youth hockey these days, which takes a great amount of leadership. I have used Jeff and Bobby’s names in speeches numerous times when talking to my players about leadership. Every great team must have great leadership, and we had that covered. Plus we had guys like Shawn Germain. Talk about a player who would giver EVERY second of EVERY shift. Who could forget when he blocked a shot with his ear almost fell off. Man, these feelings are giving me goosebumps. JB: Everything went smoothly until the league finals against Vernon. You fell behind 2-0 in the best of seven series. You managed to come back and win four straight to capture the league title. What happened between games two and three that triggered the come back? AP: We never panicked. We knew we had games at home to get back in the series, and we fully believed in ourselves. I also remember Harvey telling us he wouldn’t pick any other 20 guys in the country to be in this spot with. We just had a strong team belief. We never worried, never got caught up in big or small situations. We had 20 winners, with winning mentality’s. That goes a LONG way in hockey. JB: Two years after playing a third and fourth line role you were named team captain and led the team with 54 goals. What or who do you credit with your ability to advance that far in two years? AP: I credit the Chiefs organization. They breed winners. If you’re willing to work hard, learn from great coaches like Harvey, and pay your dues, you can ultimately have success. I WANTED to be as good as I possibly could for this team and all they had done for me. I have to give a lot of the credit to my host family Lynn and Elaine Nickles. They made me feel right at home, and like I was part of the family. When you’re comfortable off the ice and can focus with just being a hockey player, the chances of succeeding really enhance. I would be stupid to not point out the obvious person to give the credit too, and that’s Tyler Burton. He was my linemate that year and we had an amazing connection. He could find my stick anywhere on the ice, and to this day he is the smartest player I have ever skated with. That kid could see the ice, and where the play was going, faster then anybody else. I was the benefactor of being on his line, and I will always be thankful for Tyler. He has an amazing family as well, and we bonded many many times. 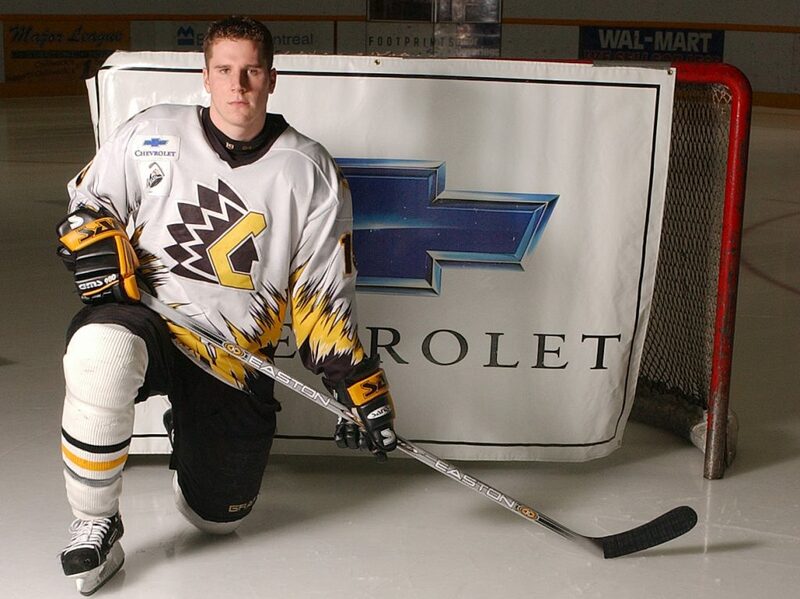 In Part 2 Adam tells us what he’s been up to since his playing days in Chilliwack ended in 2004. After Chilliwack I played Division 1 college hockey for the Alaska Nanooks of the CCHA. I played college hockey for two seasons, and realized that wasn’t the path for me. In the summer of 2006 I decided I would move on from college hockey and try my hand in pro hockey. I honestly looked at a map, found a team closest to Port Aransas, Texas, and called the coach Ken McRae. The team was the Corpus Christi Rayz and I made the team out of camp. Corpus was a great organization with a great arena right on the beach, and I loved my 4 years playing for them. I had great success on and off the ice, and as awarded fan favorite 3 out of the 4 seasons. The biggest thing that happened for me in my first season was meeting the one and only Jessi Smith (now Powell). We started dating my first month or two in Corpus, and out of all the amazing things I have accomplished and been able to do in my life, Jessi is the GRAND PRIZE. I proposed to Jessi in December of 2009 at center ice of our home rink during a private skate I coordinated (romantic right?) with music, the jumbotron, etc. We got married August 7th, 2010 in Port Aransas, Texas. I retired from hockey that summer, and lived one more winter in Corpus Christi with my new wife and started coaching youth hockey that winter. In the spring of 2011 we decided to move back to Fairbanks, Alaska as I was offered a job running a hockey camp and also coaching a youth team starting fall of 2011. I spent so much time at the rinks that year that I got offered a job to run the practice rink of the Alaska Nanooks as a University of Alaska Fairbanks employee. I have since transitioned into what I would call my career as a Director of Operations for the Carlson Center here in Fairbanks. We are the home arena for the Alaska Nanooks, and also are the arena that hosts all of Fairbanks concerts, trade-shows, conventions, etc. I work for a global company called SMG, which operates facilities all over the world, including hosting the last 3 out of 4 Super Bowls. I am VERY involved with youth hockey in Fairbanks, and have really enjoyed doing that for the last 8 years. I have been able to coach kids from all over the world, including all the way in Denmark, which Jessi and I go to each July for a camp. I feel lucky to be able to coach kids and help them become a better person and hockey player. The foundation that Chilliwack and it’s organization instilled in me really translates in my coaching. I have been lucky enough to bring one of my teams to a game in Chilliwack a couple years ago, and it was against Langley. So it was great to see Bobby Henderson doing his thing behind the Langley bench, and also show the kids the arena and locker room. I am again bringing my team to Chilliwack on December 29th, which we are all excited about. I also need to thank my wonderful parents. Without them, I would of never been able to have the opportunities I had. They both worked extremely hard to make sure their three children had opportunities to excel. I am so thankful that they lived in Seattle when I played in Chilliwack and were able to attend so many games. We still talk about Chilliwack like it was yesterday. That is my story in a nutshell. I look forward to seeing you all on December 29th in the Captains Corner. Defenseman Jeff Barlow spent three sesasons in a Chiefs uniform and was one of few to appear with the club in both the 2000 and 2002 Royal Bank Cups. I caught up with Jeff recently to discuss his time in Chilliwack. Come back for part two next week. Jacob Bestebroer: Let’s start with your decision to come to Chilliwack. What was it that made you decide to come here? Jeff Barlow: I was cut by Darcy Rota my 17 year old season with the Burnaby Bulldogs which was their inaugural season in the league, after finishing that season and second with the Richmond Sockeyes, I was highly motivated to make it to the BCHL for the 99-00 season. With options available, everything kept pointing me to Chilliwack. Once I got to know Head Coach Harvey Smyl, the city, the coliseum, my heart was quickly set. Chilliwack Chiefs were always competitive, and l thought this would be the best fit for my game if I could crack into the lineup. JB:Your thoughts when finding out you made the team? JBarlow: Making that team was a big goal for me, and not being the most gifted player I really needed to do all the little things right to find my spot. Thrilling news for me to say the least, plus my two teammates from the Richmond Sockeyes made the team in Jay Layzell and Matthew Gibbons which made it even better. Certainly was a relief to know you’re a part of the team and you could then really focus your attention on becoming a better player and teammate. Paul Nicolls did a great job with the D-core, and really helped me bring my game up another level in my first season. JB: At what point did you realize you were playing for a contending team? JBarlow: After a grueling training camp I realized how much it meant to the players, coaches and entire organization to be competitive day in and day out. We had a good mix of veterans with the likes of our captain Travis Banga who was one of the premier players in the league, Nathan Martz, Rob Marshall, Wyatt Tunnicliffe, Kevin Estrada, and Shawn Landry. Adding to that were some young talents in Jeremy Jackson, Gabe Gauthier, and goaltender Ryan Cyr. All along I believe the entire dressing room felt like this could be a championship team and contend for an RBC Cup. Each and every guy played for that crest on the front of the jersey, committed to winning and doing so collectively as a team. JB: Memories from that 2000 league championship run? JBarlow: Such a well rounded group. Come playoff time it was hard for teams to compete against the grit and toughness to go along with premier scoring and goaltending. League was competitive that season, and the Island division especially had some good teams. Believe We ran into Nanaimo for the coastal conference championship. One of the best series I got to play in while in the Chilliwack. Guys put everything on the line to get through that round. Series went 6 or 7 and took a lot out of the boys, with the final game going deep into OT. Meeting Vernon in the finals, and we as a team we’re rolling on all levels. Our offence was so potent, and won that series think in 5. Had a bye into the RBC as Fort McMurray was host and won their league. Still played for the Doyle Cup, losing in 5 or 6. Our squad was banged up to say the least, still ready and willing to compete at the RBC. Certainly took a lot of commitment from each guy to even get through The BCHL. Come RBC, and we battled our way into the semifinals Believe 2-2 in the round robin. With not a lot of bounces going our way, we lost and the eventual winner being the host. Oil Barons had a really solid and healthy team. Scottie Upshall was a part of that team, one exceptional young player back then, and still playing a good game in the NHL today. Tough to lose, but we had a chance to play for bronze medal. Not easy putting on the gear for that game, but we found enough fuel to win our last game of the season. JB: Talk about the experience of the 2001-02 season, the Doyle Cup and being named top defenseman at the Royal Bank Cup in Halifax. JBarlow: What a season that was, incredible. Head Coach Harvey Smyl put together another team ready to compete at a high level all over the ice. We had the best Jr.A fans in the Old Barn then, every night was full of energy. I don’t think we lost more than just a few games in the Coliseum all year long. Playoffs felt like they arrived quick. Through Coquitlam, Into the second round and beating my hometown Eagles in Surrey was a fond memory with all the battles we had against that team. Nanaimo next, and wow, What D-Partner I had in Shawn Germain. Brothers on the blueline. Vernon in the finals and after losing the first two we went on to win the next four straight. Drayton Valley And this team was different from any other team we had played. Think we had another bad start, battled hard again got it to I believe game 6 at home. I didn’t score many big goals but with less than 5 to go in the third, put one in from the blueline to tie the game at 3. David Van Der Gulik, who was so good being at the right place at the right time around the net finished the series off in OT. It was so loud in the Barn and packed more than I had ever seen, it was such a good moment to win the Doyle Cup in Chilliwack. Energy there was crazy. Everyone played through the bumps, breaks, and bruises to earn that championship. Tough to lose again in the semi finals at the Halifax RBC. Blueline was a little banged up during the tournament and fell a couple wins short. Certainly an honour to captain that team, and watch my teammate win Jr.A Player of the year and MVP of the tournament. Jeff Tambellini worked hard and deserved all of it. I was pleasantly surprised to walk away with the best D man award. Believe Sanford was close to the record for goals in the BCHL post season, and prolly had 6 guys with 25 goals or more in the regular season. Every guy knew his role and played it well. Must say I liked watching our bottom six just as much as our top six for different reasons..
Mark Woywitka was a pleasure to watch on the blue line game in and game out, and a Dan Mahe fight was as good as any. Dean Kletzel was perfect to run the D-core and Harvey Smyl was more than just a head coach, he taught a lot of young teenagers how to become respectful young men. JB: Thanks for doing this Jeff, to finish off, let Chiefs fans know what you are up to now. 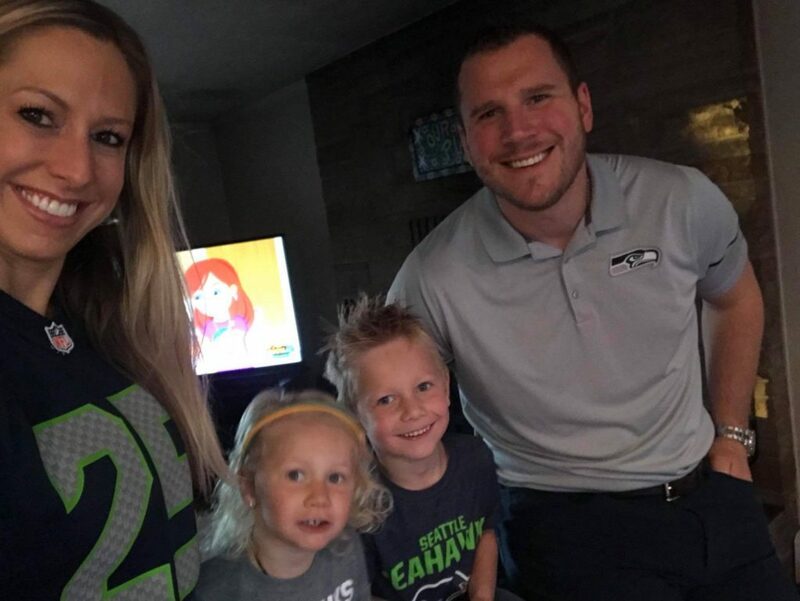 JBarlow: Spending time with the love of my life Brittany, raising our two boys Hudson, 5, and Holden, 2, while working in the Fraser Valley within the water treatment and supply industry. I recently caught up with former Chiefs defenseman Shawn Germain. We are doing this feature in two parts as Shawn was getting ready to head to South Korea for the Olympics where his wife Rachel Homan is the skip for the Canadian women’s curling team. In part two I will talk to Shawn about his pro hockey career, what he’s up to now and of course his experience with his wife at the Olympics. what you thought your chances of making the team were? Shawn Germain: I was playing Jr. B in my hometown of St. Paul, Alberta and to be honest I was more focused on baseball at the time. Despite that, I was having a good year and played quite a few games towards the end of the year with the Jr. A team in Bonnyville 45 minutes down the road. I played well with them and I guess grabbed some attention including some from Harvey Smyl’s youngest brother Dean who lived in town. Dean talked to Harv and asked me if I’d be interested in going to try out in Chilliwack. Now in those days especially, you never would have dreamed of turning down an opportunity to play in Chilliwack. The pipeline was firmly established with players like Corey Demoissac, Chris Leroux, Jeff Yopyk and one of my childhood heroes, my cousin Aaron Boucher. Dan Mahe was already there and we grew up playing together and if I needed anymore convincing my other childhood hero…. My Dad… played in Chilliwack with the Bruins way back in the day. I really didn’t know what my chances were. Maybe I was naïve but I got a lot of good advice to just go in, play my game, stay within myself and let the chips fall where they may. I knew Chilliwack was going to be a contender. I knew they only had two spots open on the back end but I had a good camp and felt I had done everything in my power to make it. When I look back, I am eternally grateful to Dan for making me feel comfortable in camp and that first part of the season. It made all the difference in the world. JB: That team was indeed a contender. They put up a record of 46-10-1-3. What do you remember about that season. I’ve attached a spread sheet if your memory needs any tweaking. Tell us about your overtime goal in the playoffs against Nanaimo. SG: To be honest, the first ten games or so I was just in survival mode. There was some catching up to do and I just wanted to prove that I belonged. at about game 15 I was paired up with Jeff Barlow and everything changed. We clicked right away. Jeff gave me a ton of confidence and I think he felt he could jump in a bit more and know I’d be back there to cover for him if things went a bit sideways. We often would be paired up against the others teams top line and with that I had found the role that I would pride myself the rest of my junior and pro career. Other than that it was just the most fun I’ve had playing the game in my entire life. To have a front row seat to watch some of the amazing players we had day in and day out was incredible. I didn’t know it then but they were making me better every single day. I’ve never played on a team that was that tight knit. We did everything together. There was never a guy that was left out of any event or get together. Everyone was pulling on the same end of the rope. It was a big part of our success. To this day, when that team gets together, its like we never went our separate ways. It’s funny. When I look at that spreadsheet, there’s certain things I remember and certain things I don’t. I remembered that we only lost two games in a row twice. Once in the regular season and once in the playoffs. Dan Mahe and I are still great friends to this day and when we get together our wives always joke that sooner or later our conversations will go back to our time in Chilliwack together. What can you really say about that team? We had 3 guys that went on to play in the NHL. Several guys that went on to play in the NCAA. And to top it off we were tough. We had to be among the top teams in penalty minutes. When we got rolling it was just fun. It was fun watching that top line “Gabe (Gauthier), Tamby (Jeff Tambellini), Vandy (David Van der Gulik)” go to work every night. Sanny (Micah Sanford) had 50 goals. Bettsy (Kaleb Betts) was a freight train on a nightly basis. Tyson Terry played every game as if it was his last. (Jeff) Woywitka was a wizard on the back end. I could go on and on. It was just fun to be a part of. The best part about it and what made it so special was that we were playing in front of sold out barns every home game. These memories would be nowhere near as special had we not had that atmosphere in the ol’ barn. The playoff run. Very emotional in several ways. Ups and downs. I swear I have about 40 Harvey Smyl quotes stuck in my head from that playoff run. The first round against Coquitlam was a lot tougher than it looks on paper. That team worked really hard and they gave us all we could handle. Surrey was always a hard fought series but I think we all knew that if we were getting out of the coastal conference, it was going to be through Nanaimo. They had a great team. I remember we got off to a great start in the series going up 3-0. But they got a win at home to make it 3-1 and game 5 in Chilliwack they were starting to turn the momentum a bit. They were getting more confidence. I think everyone on our team had the same feeling, we DID NOT want to go back to the island for game 6. I had 6 points that regular season and it’s not because I didn’t play much. By mid season I’m sure I was playing at least 20 mins a night, in the playoffs probably more. But I hadn’t scores my first junior goal yet. It didn’t really bother me. The guys probably wanted it for me more than I wanted it myself. Harv had even put me out up front on some PP’s with the NHL line in some blow outs. I remember Vandy set me up for a back door tap in…..which I proceeded to shovel wide. I honestly don’t remember much about the OT goal. I remember we were out with the NHL line. I remember the puck squirted into the high slot. I just took a quick shot through traffic low glove because I knew Vandy was on the doorstep so I thought if anything he could pot a rebound. But wouldn’t you know it, it went in. I just remember turning around and seeing Terry first off the bench and then the whole team pouring out after him. I can promise you the feeling of joy that I had at that moment was not that I had scored my first goal but that we didn’t have to go back to the island to game 6. So on to Vernon. We go in there and drop the first two. They may have been the longest bus ride home ever. You can imagine a bunch of teenagers feeling like their entire season was going down the drain. I will never forget the speech Harvey gave at the start of our next practice in Chilliwack. He said “if I could pick any 20 guys in the country to go into this situation right now, these are the 20 I would pick”. I think everyone had chills in that moment. It gave us the confidence to overcome the hole we had dug ourselves. We rolled through Vernon the next four. Drayton Valley had an amazing team with a few of their players going on to play in the NHL as well but I think we knew that if we could get out of there with at least 1 win we could muster up 3 in the ol’ barn. What better way to win it then with a double OT win. SG: Getting an opportunity to cheer on my wife at the Olympics was amazing. To experience the greatest sporting event on the planet was an experience all of us will never forget. I am so proud of Rachel and her teammates on what they have accomplished to this point in their young careers. The work they put in is incredible. South Korea is a beautiful country with the friendliest people you will ever meet. They did a fantastic job in hosting the event. The city was so clean and the Koreans take such pride in their homeland. JB: Let’s back up to 2003 and your junior career ends. You decided to play at a few different Canadian schools before turning pro. Take us through those decisions. SG: In the ’01-’02 season I became really good friends with (former Chiefs defenseman) Mark Woywitka and he had gone to play at Grant MacEwan college in Edmonton and had great things to say about the team and the league so I thought it would be a good bridge year for me to continue to play hockey and hopefully it would open up some options. We had an amazing team and ended up winning the league championship. From there I got recruited by Karl Taylor to go play in the CIS for the university of Waterloo. I did my own recruiting that year as well as I persuaded (former Chiefs goaltender) Curtis Darling to come along as well. After a successful year there I decided that I wanted to pursue pro hockey and see how far I could go. Add to that that Karl left to go coach in Reading in the ECHL. I decided to go play my first pro season in the old Central Hockey League and was fortunate enough to earn a spot with the Oklahoma City Blazers. It was an unbelievable place to play and an amazing city to live in. I then connected back up with Karl Taylor in the ECHL with Reading the following year. After slowing working my way up the depth chart I got an AHL call up with the Hershey Bears right around Christmas that year. It was an experience I’ll never forget. I played another year in Reading after that, receiving Defensive player of the year both years. It probably didn’t hurt that (future NHLer) Jonathan Quick played the majority of that last year haha. After that season the LA Kings moved their ECHL franchise out to Ontario California. Karl would move with the franchise and asked if I would be interested in following him there. I actually acted more as a player coach at that point and had developed a lot of trust from Karl. Ontario was an amazing place to play. Going to the rink in shorts everyday is always fun. After 3 successful seasons in Ontario, the last of which I received player of the year honors, I decided that it was time to hang up the skates. Or so I thought….. At the end of that year I got a call from Ron Hextall asking me if I’d be interested in coming to Manchester for their playoff run for the Calder cup. They were up 3-1 on Binghampton and if they made the next round they were going to be short a Dman because he was headed for surgery. Well they ended up coming back to win that series and I never got into a game. That being said it was a great way to cap off a great career. I was rooming with Brayden Schenn. I got to reconnect with a bunch of guys that I played with in the minors (Jeff Zatcoff, Bud Holloway and Dwight King) and I got to practice with bunch of future NHLers (Jake Muzzin, Martin Jones, Tyler Toffoli) for a week and a half. I’ll never forget walking around the room at one point and seeing pictures of past Monarchs and there was one of Gabe Gauthier and one of Jeff Tambellini. Things had come full circle for me. All the hard work in Chilliwack had led me to and through a pro career I was proud of. I squeezed every last bit out of what I was given. I can live with that. JB: You’re still active in softball, I know you’ve had some great team success. SG: Well I’ve always loved baseball and played some pretty serious ball growing up until I started playing in Chilliwack, when hockey became more of a priority. I would just come home in the summer and play slow pitch softball with some friends. As time went on I started playing at a higher and higher level until I was picked up to play for the Alberta Oilmen. With them I’ve been fortunate be apart of 6 provincial titles and 2 national championships. I was named softball Alberta’s player of the year in 2016 and I was also selected to represent Canada at the Border Battle vs the USA 3 times. One of my teammates on those teams is a Chilliwack boy himself, Chris Parr. Chris and I are great friends. JB: Lastly – what keep you busy these days? SG: I am a Journeyman power line technician back home in Alberta. I love my job and I enjoy being back home. I still play lots of ball and my fall months are spent one the 150 acres I have hunting game. I still enjoy coaching kids in hockey when I can. Hopefully I do more of that in the near future. Travis Banga spent his final two seasons of junior hockey in a Chilliwack Chiefs uniform. In both seasons he scored more than 100 points, including a league leading 129 during the 1999-00 season. In part one of our feature I talked to Travis about his time with the Chiefs. Jacob Bestebroer: Good to talk to you again Travis. Let’s start out by hearing about how you ended up a member of the Chiefs. Travis Banga: My story on getting to Chilliwack is a bit of a different one. It all started with former chiefs captain and current assistant coach Brian Maloney. He was traded to Chilliwack from Olds Grizzly’s of the Alberta Junior Hockey League midway through the 97-98 season. We were teammates in Olds and when he arrived in Chilliwack he was amazed on how great the league and organization in Chilliwack was. We talked often and he said I need to come to play for the Chiefs. After season’s end and many phone calls he convinced me to ask Olds for my trade to Chilliwack. Once Maloney got Chiefs Head Coach Harvey Smyl on board he made the trade. That was the easy part. Now my dad had to be convinced the trade was the right move for me. Maloney joined me for the meeting to try and convince my dad that Chilliwack was the best place for me to continue my dream of playing college hockey. That was a brutal meeting and while we all sat down and (with many many harsh words exchanged ) Brian got my dad on board! My dad was upset because he couldn’t drive 1.5 hours to see me play and more. Instead he would make a couple trips of 10 hours to see me play. I didn’t know a lot about the league except that it was a little more offensive than the Alberta junior league and would hopefully benefit my style of play. Once everything was finalized I had to get to work in the summer as I was just coming off knee surgery to fix torn cartilage. I was so excited to get the season started and also had the chance to live with Brian at probably the best billets ever in Ross and Val Beebe’s house. Still to this day keep in touch with my Chilliwack family that treated me like one of their own kids! JB: Before we get to the playoff run of 1999, any memories of your first regular season with the Chiefs. You scored 35 goals and 73 assists in 53 games and the team went 38-20-2 (the 2 being shootout losses). I’ve attached a spreadsheet of the game by game scores. You also got to be part of the team that debuted the new black and yellow rage jerseys. Any specific memories of that first regular season? TB: There was a lot of hype going into this season with the unveiling of the new color scheme for the Chiefs. We did photo shoots and some videos if I remember right. That was one of the funnest seasons I have been apart of. We had so much talent, it was hard to believe we lost 20 games. I look back at that roster with Maloney, Vlad Klochlov, Mark Smith, Nolan Graham and Don Nichols . Plus we had young guys like Nathan Martz, Kevin Estrada, Greg Keith and on of best role players in Brandon Fleenor. There was many more I did not name but we scored so much! I was fortunate enough to play all year with Wyatt Tunnicliffe and Graham which made getting assists so easy. I thought to myself that year that this league and team was the perfect fit for my game. We had one of the best coaches in Harvey and the ownership group was amazing with the Brews and Moray Keith coming in that year. I think the best and worst memory of that year was the playoffs. Down 3 games to 1 against the Surrey Eagles in the conference finals we stormed back to force game 7 in Surrey. Then as we all remember the goal heard around the world when Jeff Yopyk scored the OT winner to take us to the finals!!! I remember it like yesterday, Maloney got me the puck on the boards and all I had to do was get the puck to Yopyk streaking through the neutral zone and he took care of the rest!!!! By the worst memory that year was losing the finals to Vernon ( who went on to win the national championship) 4 games to 1. I felt we were just as good as a team as them buy maybe we were a little tired from the series before. JB: In your second and final season you were named captain and led the team to its second league championship. Talk about that season. TB: My second and final season in Chilliwack was a season to remember. Anytime you are named captain of a team, especially the Chiefs it is a true honor! It was big foot steps to follow after all the other greats, but one I was excited to try fill. We had such an amazing roster of young and old talent. We had everything from scoring to toughness. To be able to play on a line all year with Martz and Jeremy Jackson was crazy. Martz playing in his draft year was really showing what he could do, while Jackson was one of the most pure goal scorers I have ever had the chance to play with. We got Rob Marshall from Saskatchewan, who was huge for us. Jody Lapeyre from the Western Hockey League, and probably three of the toughest guys in the league with Ashlee Langdone, Jeff Barlow, and Bobby Henderson. Then we get a 15 year old Gauthier from California who was so good for that age! I was able to get Greg Keith to live with me and he had a season to remember by tripling his point total from year before and scored 43 goals ! There wasn’t a game that year that I thought we couldn’t win… I was so fortunate to win the scoring title that year and after suffering knee injury in first round of playoffs I had to watch and support the boys take us all the way to the finals for a rematch vs Vernon. Hardest game of my life that year was the double overtime with against Nanaimo when Harvey let me dress ( I was not ok to play ) but I sat on the bench the whole game wanting to play, but just supported the guys the best I could. Winning the BCHL championship in Vernon was one of my best highlights of my playing career and getting revenge on them from year before. We were champs and gave the best fans in junior hockey another BCHL championship! JB: After winning the BCHL title, you advanced to the Doyle Cup best of seven series against the Fort McMurray Oil Barons. Both teams knew they were advancing to the nationals championship at For McMurray was the host team that year. TB: The Doyle cup was a weird series. We knew the second Fort MAC won we were automatically in the RBC because they were hosting. So some might say it was a hard series to get amped up for, but I took it as a great opportunity to get back in shape and get my game honed in. It was a tough travel trip but having the class A ownership they flew us to fort Mac instead of bussing. If my memory is correct we lost the Doyle cup 4 games to 1, but the team had just played their hearts out to win the BCHL championship and we were excited about the next step… winning the RBC!